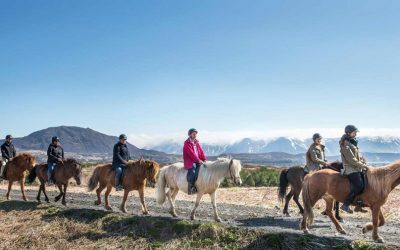 Explore the beautiful scenery that Vik has to offer, in the company of the friendly Icelandic horse. 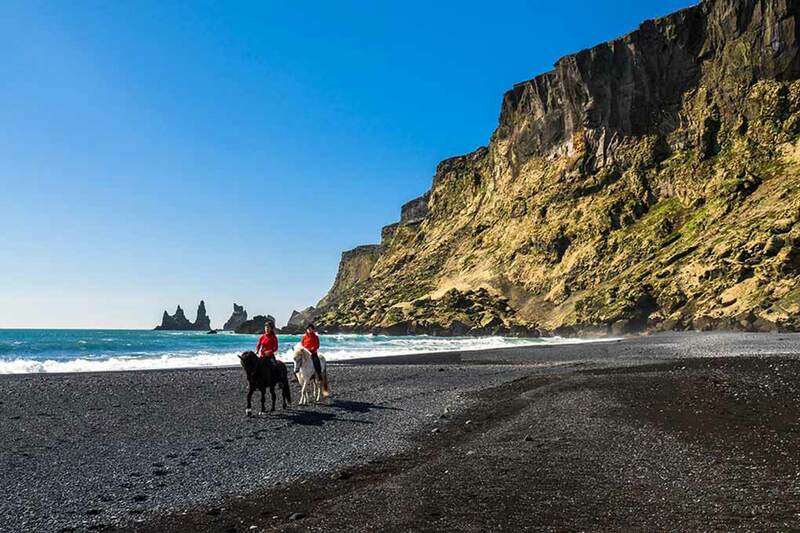 This adventure will take you on a horseback ride through dramatic volcanically scarred scenery, along Iceland’s iconic South Coast. 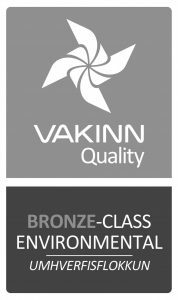 We will be exploring the award-winning Víkurfjara Beach, whose jet-black volcanic sands will inspire awe and wonder in equal measure. 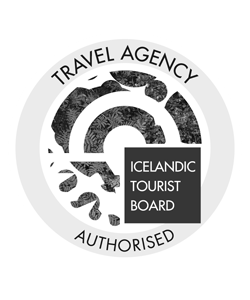 That combined with the opportunity to ride the famous Icelandic horse, whose isolation has meant that it has remained unchanged since the time of the Vikings, ensures that this magical tour will provide you with memories that will last you for the rest of your life. 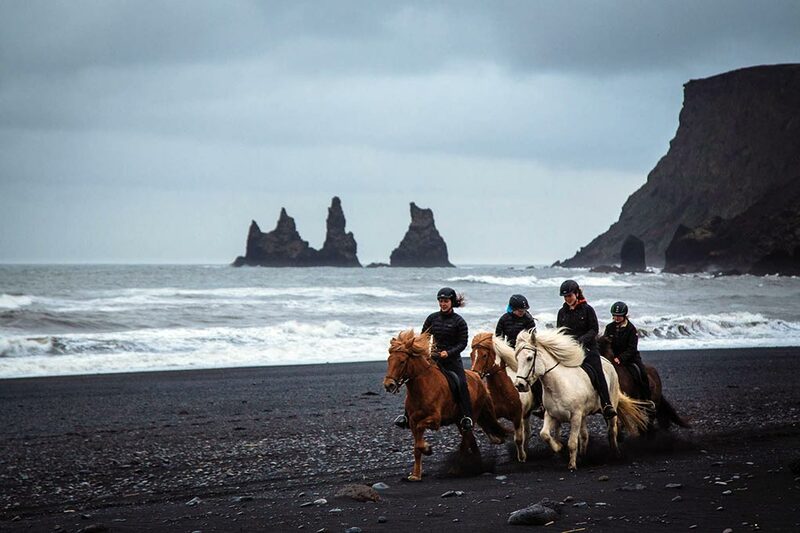 The day begins when we all meet up at our stables close to the picturesque village of Vik, where our friendly guide will provide us with the equipment we need and deliver a short safety talk. Then it will be time to meet the horses and our guide will ensure that everyone is matched with a horse that is appropriate for their ability. Then, once everyone is comfortable, we will head out onto the coal-black volcanic sands for a day filled with fun and excitement. Víkurfjara is truly a one-of-a-kind place, replete with dark volcanic sands, spectacular naturally formed lava sculptures, glorious basalt sea stacks that rise in symmetrical curves and sheer cliffs that hide a multitude of different seabirds. As we make our way through this stunning landscape, you will instantly be struck by the majestic contrast of the white-crested waves against the jet-black sands. It will enamor all your senses at once – the cries of the seabirds echoing around the cliffs, the salt in the air filling your nostrils and the cool wind blowing against your face. 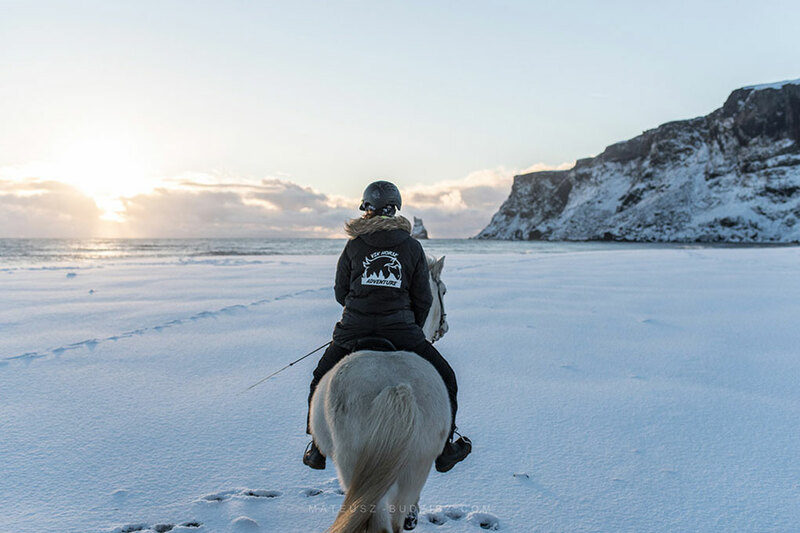 There is no better way to enjoy all the magic that Iceland has to offer than on the back of a sturdy Icelandic horse. They are smaller than most horses (around 128cm to 148cm) in the world and have a unique set of adaptations that make them perfectly suited to the extreme conditions of the land of fire and ice. 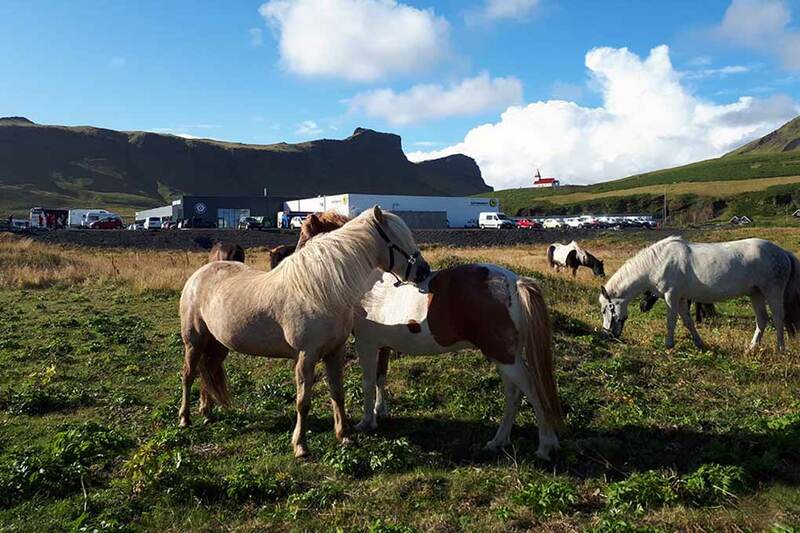 They were first imported during Viking times and strict export and import laws meant that they became isolated from the rest of the equine population, meaning that they have been the same for more than a millennium. Perhaps, their most striking feature is their unique gait, known as the ‘Tolt’, which means that they always have at least one of their hooves on the ground. Our friendly guide will be with us every step of the way to tell us more about these wonderful creatures and all the spectacular sights that we will see. 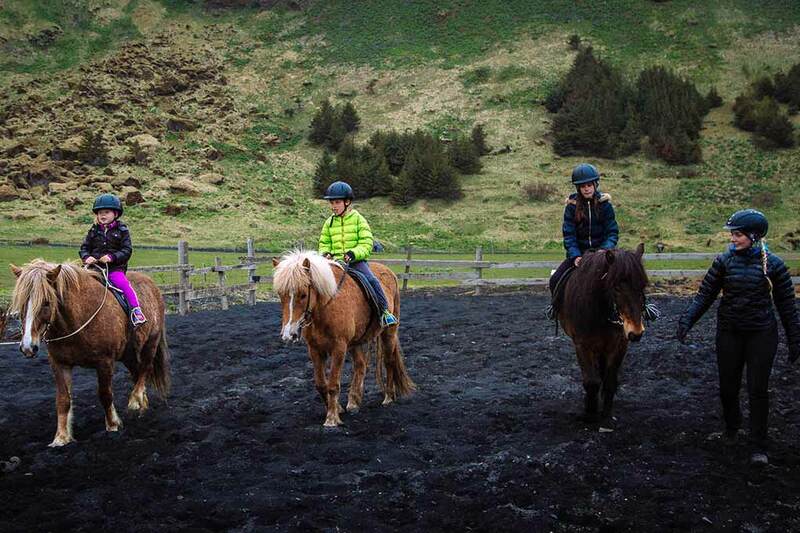 We also offer a shorter family version of the tour for our younger riders that is 30 minutes long, taking an easier and shorter walk across the stunning Víkurfjara Beach. 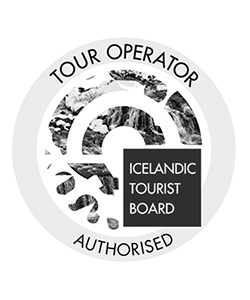 If you have young children with you (all riders must be over the age of 6), then please inform us that you would like the family version of the tour during the booking process. 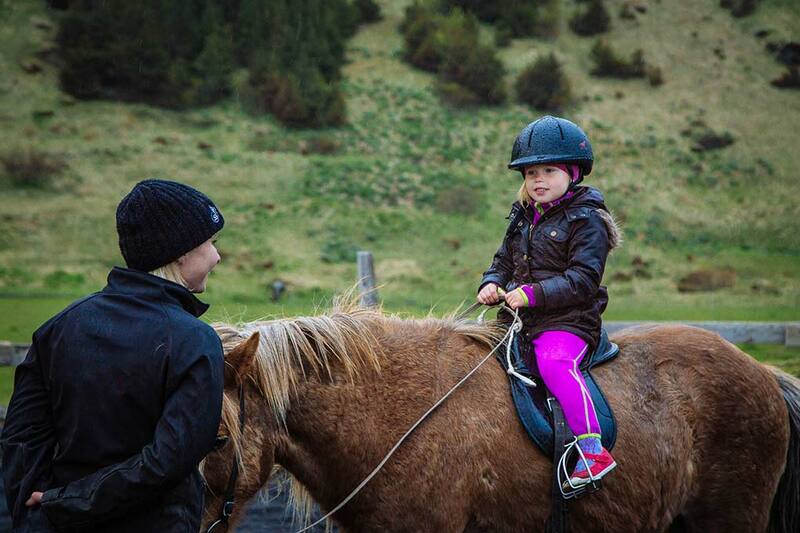 The tour will take place under the watchful eye of one of our riding experts, who will ensure that the little ones are safe, making it the perfect educational experience for budding young horse-enthusiasts. What to bring: Warm layers, a weatherproof top layer, headwear, gloves, scarves. The meeting point is at Vik Stables. We ask you to arrive 15 minutes prior to the departure time that you have chosen. 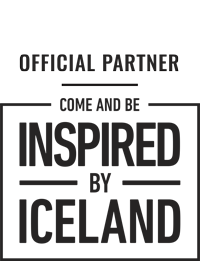 This allows time for you to get prepared for the tour, and we will be ready to leave on time. GPS coordinates for the stables: 63°25’01.9″N, 18°59’42.2W. Is there a weight limit to join this tour? Yes, the weight limit for this adventure is 110 kg / 242 lbs. This is of course with the welfare of the horses in mind. You can choose from various departures in the booking widget. We ask you to arrive 15 minutes prior to the departure time that you have chosen. This allows time for you to get prepared for the tour, and we will be ready to leave on time. Will the tour be operated if it's raining? Normally we do operate the tours if it’s raining. Excellent waterproof jackets and trousers are available, as well as gloves. The Icelandic horses are used to rain and wind. Is it possible to get picked up in Reykjavik for this tour? Unfortunately, we do not offer transportation for this tour. 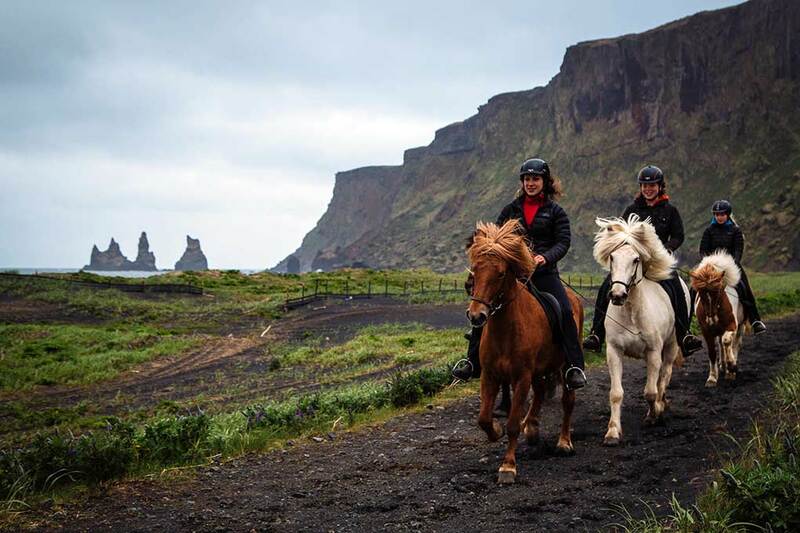 Check out our selection of Horse Riding tours, as many of them offer transportation from Reykjavik. 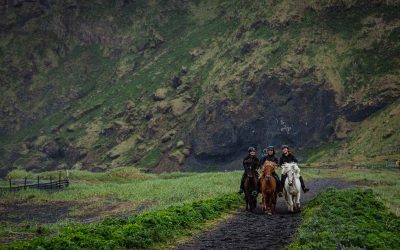 Saddle up for a scenic horseback adventure through mystical landscapes of hidden trolls and mossy lava fields! 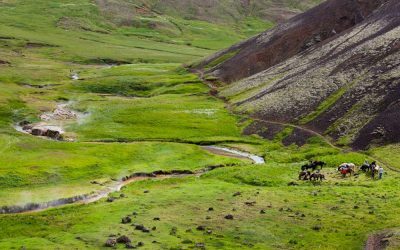 Hike up the geothermal valley of Reykjadalur & get the chance to bathe in the water. 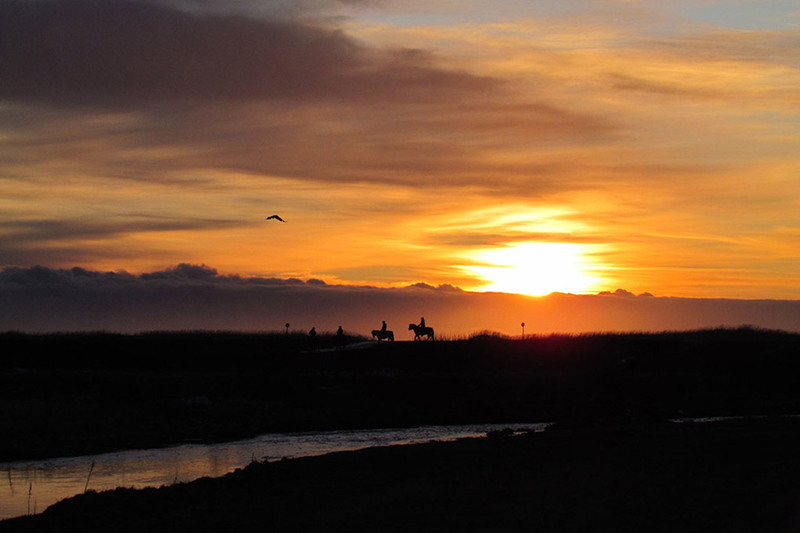 Afterwards, ride Icelandic horses in the beautiful countryside.